Incorporated in 1967, we, "Microteknik", are prominent manufacturers, suppliers and exporters of a comprehensive range of Waste Product Incinerator such as Animal Incinerators, Bio-Medical Waste Incinerator, Electrical Incinerator and General Waste Incinerator. Within these four decades, we have garnered immense recognition for coming up with products that are characterized by superior quality and innovative designs. We are committed to the cause of keeping the environment clean and have created solutions that enable hassle free disposal of waste without harming the environment. We have established a world class infrastructure to enable smooth operations. All our products are manufactured keeping in mind international quality and safety standards. We also export our products to different countries, some of the countries where we export our products are Asian Countries, African Countries, European Countries, USA, Australian Countries. We have taken several measures for that purpose. In addition, we have streamlined our production process so as to gain efficiencies and pass them on to our customers. Application of advanced technology and innovative skills has led us to acquire an enviable position in the market. We lay great emphasis on ethical business dealings which has led our clientele to place immense trust on us. We have earned a respectable position in the market under the leadership of "Mr. Vikas Jain", with his vast business experience and ethical business strategy. Our organizational culture is characterized by strong values and commitment to our customers’ benefit. We have handpicked our team members keeping in mind the same. We are poised to move forward in a similar fashion and expand our horizons further. Our sincere and diligent team of professionals are focused towards providing an unmatched range of products to our esteemed clients spread all across the globe. Our developed product range is in accordance with the current market trends and specifications provided by the clients. Our sophisticated Infrastructure is spread in a sprawling area and segregated into different departments such as production unit, R&;D unit and quality testing unit. These departments work in sync to meet the appreciable rate of production and clients urgent requirements.We have state-of-the-art manufacturing unit, which is equipped with high-end machines that allow us to design laboratory and process equipment & system as per defined industry standard. Certification Name: International Organization for Standardization Certification Type: ISO 9001:2008 ( Valid until December 31, 2013 ). Driven by a strong motivation to excel, Microteknik meets rigid quality requirements, which helps us in reducing risk and enhance competitive advantage, thus helping our customers to move on the path to progress and us to move on the path of global recognition. 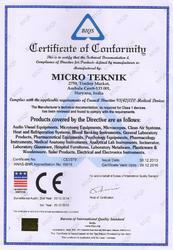 Microteknik has been a leader, both in terms of product manufacturing and product reliability. 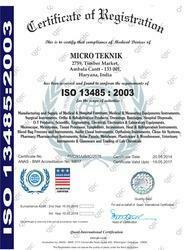 Certification Name: International Organization for Standardization Certification Type: ISO 13485 :2003 . 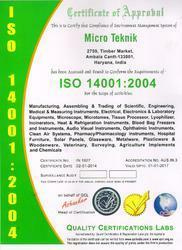 Certification Name: International Organization for Standardization Certification Type: ISO 14001:2004 . 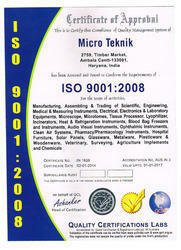 Certification Name: International Organization for Standardization Certification Type: CE Certificate.